product developer/systems engineer, Xerox Corp.
Dr. Resnick joined the space program in January, 1978. She was a mission specialist on Discovery shuttle's maiden mission (STS 41-D), launched from the Kennedy Space Center, Florida, August 30, 1984. Resnick logged 144 hours and 57 minutes on that flight. 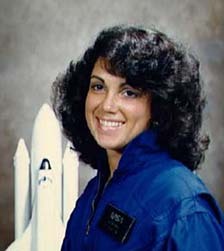 She was one of seven astronauts that died on the January 28, 1986 Challenger shuttle mission (Shuttle Mission 51L).